We all know that custom framing can enhance a piece of art or preserve a memory but while it’s doing all of those great things, a fantastic custom framing design can do the unexpected! Here are 3 of my favorite crazy and amazing custom framing ideas. ​I’ve been in this dilemma many times with house renovations. How can you make a standard door into something original and beautiful? Check out this door that serves dual purpose as a work of oversized art. When the door is closed, this large custom framed piece can’t help but be a showstopper and then magically turns into a door when you want to access the next room! ​Along this same idea, a custom piece can mask the not so beautiful items in a room or create seamless storage options. 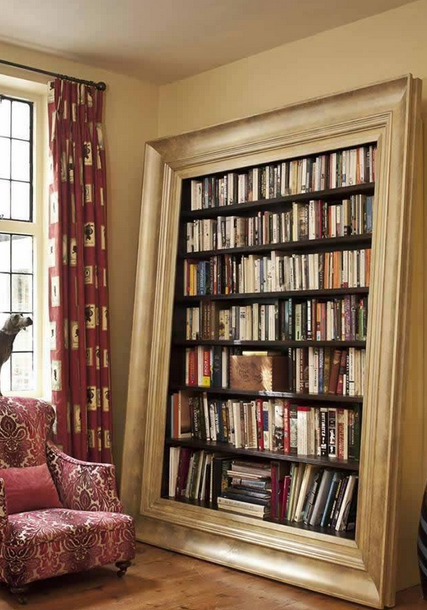 Books are works of art so why not create a custom bookshelf with framing! This piece is stunning and can of course be used as shelving for other items. ​The television has also been one of those sore items for designers. We love them but they aren’t always attractive. There are many ways that custom framing can help mask a TV but this one caught my eye as a top contender. Hinged folding frames hide this TV from sight when not in use and simply fold open when you want to watch your favorite show.